A new season means a new series of Seattle Opera’s much-loved Spotlight Guides, which offer a crash course on each opera—the characters and story, the historical background, and a little about its composer and musical world. 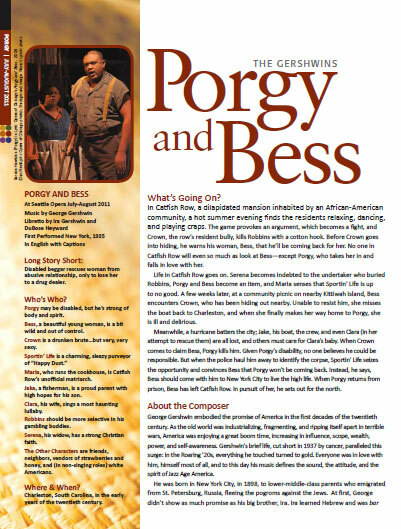 Kicking off the 2011/2012 season is Porgy and Bess, and our Spotlight Guide for this American classic is now available online as a PDF, or as a download for Amazon’s Kindle e-reader. 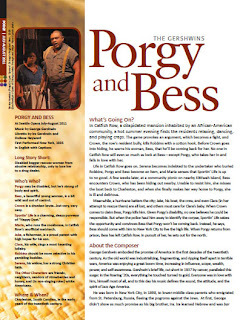 (Hard copies of the entire 2011/12 Spotlight Guide Series are included in our new Souvenir Book, which was mailed to subscribers this week.) Spotlight Guides for Carmen, Attila, Orpheus and Eurydice, and Madama Butterfly are also online, as well as the guide for Don Pasquale, which our Young Artists Program will perform in the spring. Want more opera content on-the-go? We've also made our blog available as a Kindle subscription, so you can read our artist interviews, see behind-the-scenes photos, and keep up with Seattle Opera news wherever you are! Awesome,Good thing that you continue to give us informative article where we can learn things such as preparation to have a good production scene.